Youtube is an American website where the video has been shared worldwide. Google its buy in 2006. Here you can earn money through youtube after approved your activate AdSense account. There are many Youtubers and Youtube Channels, which are earning millions of rupees per month by uploading 2-4 video videos on Youtube every month. If you have a little talent or you can do something that people like, then you can earn money by sitting at home in your house and uploading a video on YouTube. 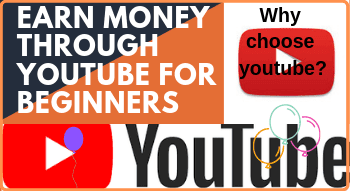 By the various way to earn money from Internet required investment in all Online Money Making Ideas, but Youtube is a great option in which beginners of internet earners can earn well without investing. Youtube's biggest advantage is that there is already a huge audience on YouTube. This is a readymade platform for you. This is not a hard job like blogging or other online money making options. In blogging, you first have to reach the right Audience by hard work and it takes a lot of time for success. While in Youtube you only have to upload the best Video Content and write video description correctly. If your video content is fantastic then the rest of the work will be done by the viewers SUBSCRIBED, LIKE and COMMENTS already present there. You do not need any Domain or Hosting to earn money from YouTube. For example, if you want to start your own blog on WordPress or any other platform, then you first need a Domain Name and hosting service to host it, while you can get your Gmail ID You have to log in and create your own Youtube Channel. Then you can easily earn money by uploading a video on that channel and sitting at home. You can earn from Instagram where domain or hosting is not required. Youtube is the easiest way to earn money by sitting at home and its biggest feature is that it does not take any money from us in exchange for any of our services. In almost all other ways you will have to spend some or nothing at a time, but from Youtube Registration to Video Uploading and Monetization, the whole service offers absolutely free. Another feature of Youtube included live streaming, Annotations, analytics, translation, use of the card, etc. all facility is free and reached your channel to the branded platform. Getting Google Adsense Approval in Youtube is far easier than blogs. I know many bloggers who had to wait for several months to get Google Adsense Approval but early access to Google Adsense for Youtube Channels. To Make Money from Youtube from various type of Passive income, You must first create your own channel on this. Youtube Channels is the Place where we upload our video content. For this, we have to create our own account on Youtube. YouTube is a service from Google so if you have already created a Google Account, you can also use it in Login to Youtube or create a new account. Your Youtube Channel should be related to a specific Genre / Niche. Before you can create a Youtube Channel, you should define its genre and use the related keywords in the Youtube Channel. The title of your Youtube Channel should also be Genre Specific and Easy to Remember. This will make it easier for people to join and remember. After creating the Youtube Channel, you should upload your Video Content in it. When uploading a video, it should be kept in mind that it is of Original and Best Quality. His Clarity, Sound, and Lighting should be of excellent quality. The video should not be too long because viewers do not like to watch the long and bad quality video. If the Topic of your Video is Broad, then you can separate it by dividing it into several parts. The video should be Eye-Catching. Tag your video from Genre Specific Keywords to make it easier for viewers to find it through Youtube Search. Your effort should be to regularly upload your new videos. By which you can maintain your Audience. At first, know what is your interest or passion or what type of knowledge you want to share worldwide. So choose your niche by your hobbies and make the video about them. Many people are a success to share the video of varieties of niche like singing, comedy, fashion or health advice, cooking tutorial, and technical videos. Your audience at Youtube is the reason for your earnings. According to A researches, you can earn up to 100 rs on average, with 1000 views video (although earn money through youtube depends on the content, visitors, Ads Clicks, Per Click Rate, etc.). Your earning will increase in the same proportion of the decrease in the audience. Therefore it is very necessary to increase the audience and maintain it. For this, please share your video on other social networking sites such as Facebook, Twitter, Pinterest, etc. Talk to your viewers in comments and answer the questions asked by them. Sometimes, make videos based on their questions and upload them. From this, the audience will be impressed with you and will remain with you. To monetize your video, click on Creator Studio on Youtube and then click on Status and features. After this, check the Monetization Option. After you check the Monetization Option in your Youtube Channel, you will have to link your Youtube channel with Google Adsense, which is available in the Monetization Settings on Youtube. Google Adsense shows advertisements related to your videos and whenever a viewer clicks on it, you get started to earn Money Through Youtube. Through affiliate marketing and sponsored videos, you can earn a lot of money from affiliate from YouTube. Nowadays, many companies offer Affiliate Marketing. In this, you get a link from the company that you place in the description of your video. These links are from a Buyable Product or Service. When a viewer purchases that product by linking it, you receive a portion of the price as a commission. Gradually, when your Youtube Channel is installed, you will also be getting Sponsored (Sponsors) for your videos, whose ads can earn money by showing you at the beginning or end of your video.